With the refined look of linen, these elegant navy linen weave paper covers will add a classic finish to any presentation. Our navy linen weave covers are made from an 80lb cover stock with a linen finish. These navy covers are perfect for use with any popular binding style (see list below), though we do offer these covers pre-punched (simply choose your preferred punching pattern in the drop-down menu above). Our window covers have a 1.75" x 4" window that is centered on the front cover 3" from the top edge. Take care in choosing the right cover for your needs as we offer close to 150 different colors and sizes of the linen weave variety. Cover Size: 8.5" x 11" - 11" x 17"
Very nice quality, strong and perfect cover for our appraisal reports! Had an issue trying to order on line, but called and placed the order. The order was shipped promptly and received with no issues - same quality product as always! These are good quality & the response time was nice & fast. Excellent customer service with quick delivery! Thank you for taking care of us in a timely manner. Nice product and fast delivery. Welcome to MyBinding video. 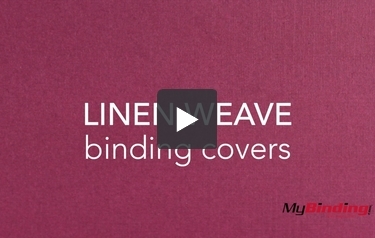 This is Linen Weave Binding Covers. They come in sizes ranging from 5.5" x 8.5" up to 11" x 17". You can choose to add a custom window to your covers or add rounded corners to your oversized coversheets. You can even select from 8 punch patterns to receive your pages prepunched. Look for variations in thickness up to 80lb and there are several colors to choose from. For more demos, reviews and how-to's, go to MyBinding.com.